The world’s largest natural pearl was brought to Abu Dhabi to be auctioned off where it is estimated at 8 million dollars. It is the biggest pearl for sale in the world. The value of the pearl is based on its size, color, weight, exclusivity & history. Discovered 800 years ago, the pearl for royalty, was originally owned by Kublai Khan, the 13rh century emperor of China & grandson of Genghis Khan. Marco Polo brought the pearl to Europe as a gift from Kublai Khan. Named after a previous owner from Austria’s Arco Valley Family dynasty the “Arco Valley Pearl” is 3.1 inches in length & weighs 575 carat. It is a baroque-shape, natural saltwater pearl with a touch of blue iridescence over a pink & cream color. “It’s 800 years old and still takes your breath away.” said Khaled al Sayegh, 35 a jeweler from Abu Dhabi. 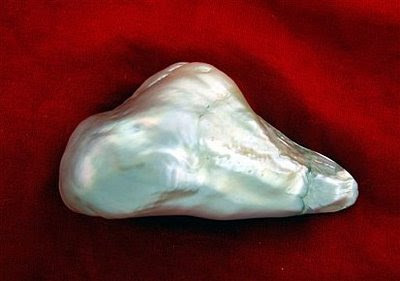 The world’s largest pearl, the “Pearl of Allah” is 9.45 inches and was found by a diver off the Philippine Island of Palawan in 1934. It is currently in the Philippine museum.